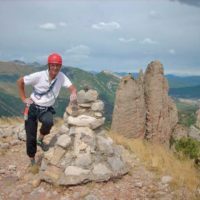 Alf Robertson is a professional walking guide and qualified member of the British Association of European Mountain Leaders (BAEML) who writes regularly for British walking and climbing magazines. Leaving a career as an English teacher in Scotland in 1996 to pursue a life in the outdoors, he has since worked as a leader for Ramblers Holidays, working in five languages in many corners of the world. In 1998 he inveigled Jane Meadowcroft out of a career in the Civil Service and the couple, now married, walk, climb, write and guide together, from a home in Cordoba, Andalusia. They have walked and climbed extensively in Andorra over the past seven years.